Peterborough Panthers have been forced into a late change of guest for their tough Premier league trip to reigning champions Edinburgh tonight (August 7). Workington man Ricky Wells steps into the Readypower Panthers line-up after his Comets team-mate Kenneth Hansen notified club bosses last night that he could no longer fulfil the booking. Wells scored a dozen points when riding for his own club at Armadale earlier in the season and promoter Ged Rathbone is hopeful the American World Cup star can perform well again in a second-versus-third showdown. He said: “We are very grateful to Ricky for stepping in at late notice. “Edinburgh is a track he rides very well, as he proved earlier in the season, and hopefully he can get us a few points. “It is going to be arguably our toughest away meeting of the season, but I feel we have a line-up capable of causing Edinburgh problems. Panthers travel north of the border five points adrift of their hosts in the standings. The Monarchs lost top spot in the Premier League to Scottish rivals Glasgow last night after the Tigers triumphed at Redcar. Teenage star Robert Lambert slots into the number one berth for Panthers with Lewis Blackbird taking over as skipper due to Ulrich Ostergaard being out injured. Wells guests for Emil Grondal, who has a fixture clash in his native Denmark, while Edinburgh legend Matthew Wethers steps in for sidelined reserve Simon Lambert. Panthers entertain Edinburgh in a return clash at the East of England Showground on Sunday. EDINBURGH: Craig Cook, Justin Sedgmen, Kevin Wolbert, Erik Riss, Rider replacement for Sam Masters, Max Clegg, Rob Branford. 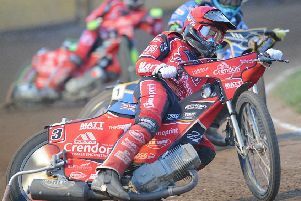 READYPOWER PANTHERS: Robert Lambert, Rider replacement for Ulrich Ostergaard, Lewis Blackbird, Michael Palm Toft, Ricky Wells (guest), Rafal Konopka, Matthew Wethers (guest).